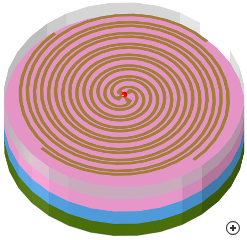 Image of the 4-arm Archimedes spiral with absorber-lined cavity backing. The cavity-backed 4-arm Archimedes spiral is a versatile structure able to operate in sum and difference mode. Mode 1 operation of the basic spiral structure produces a boresight maximum by utilising a 90 degree progressive phase shift between ports, while mode 2 operation produces a boresight null using a 180 degree phase progression. While the spiral without a cavity backing produces a backward beam equal in magnitude, but opposite in polarisation to the forward beam; the absorber-lined cavity model does not. The four-arm spiral is an extremely versatile antenna that has been used extensively for broadband, multi-octave, direction-finding applications, such as satellite tracking systems and missile antennas for homing on radio frequency transmitters. 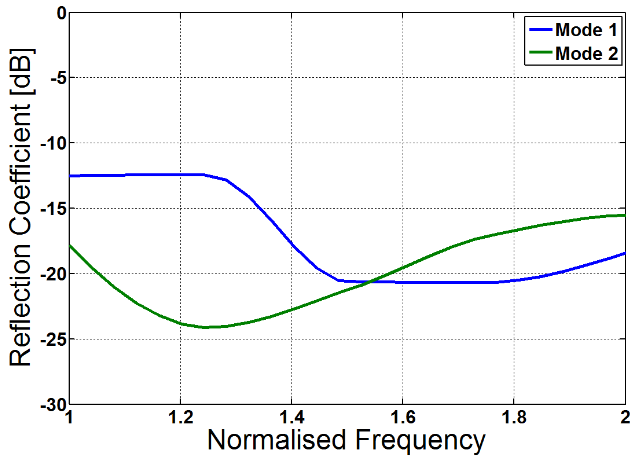 Typical Mode 1 radiation pattern at minimum, centre and maximum frequency. Typical Mode 2 radiation pattern at minimum, centre and maximum frequency. Typical S11 performance in Mode 1 and Mode 2 operation.